Prince Asaph was the son of King Sawyl Penuchel (the Arrogant) of the Southern Pennines. He was still a lad when he fled to North Wales with his father. 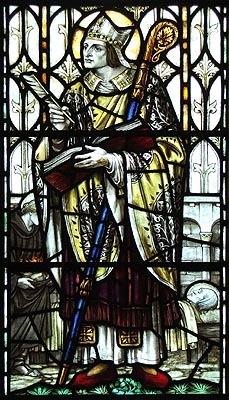 From Tegeingl he was sent as a disciple to his distant cousin, St. Kentigern at Llanelwy (St. Asaphs). One day, after Kentigern had been reciting the psalter naked in an icy lake, he asked the young Asaph to bring him some burning coals in order to warm himself. Asaph arrived carrying them in the skirts of his robe with not a sign of burning. Ever afterward the two saints would argue over who the Lord was honouring with such a miracle. When Kentigern was summoned back to Strathclyde, Asaph was appointed Bishop of Llanelwy by popular demand. In later years he founded a second monastery at Llanasa in Powys. He died there on 1st May AD 601.